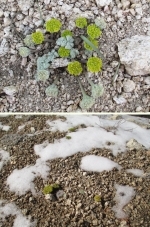 Thursday, March 22, 2018, 7:30 p.m.: Rare plants of the high San Gabriel Mountains: Oreonana vestita (woolly mountain parsley) and its associates, with Jane Tirrell: The woolly mountain parsley, Oreonana vestita (Apiaceae), California Native Plant Rank 1B.3, occurs primarily on ridges and summits that are intermittently covered with snow during the winter and spring. A study of this plant and its habitat may yield information on how plants adapt to climate change. O. vestita occurs over a wide elevation range, from 5,200 to 10,060 feet above sea level, and is associated with different plant communities according to the elevation. This talk will discuss O. vestita's natural history and phenology (the timing of events such as flowering and fruiting) and will showcase associated plants and trees across this elevation range with a focus on rare plants. Jane Tirrell became interested in native plants when she retired in 2010 from Keck Graduate Institute (one of the Claremont Colleges), where she had been Associate Dean of Faculty. She joined the California Native Plant Society that same year and became a participant in our chapter's Lily Spring Area Survey. The Lily Spring Area Survey was a phenology study and plant species survey that compared observations made in 2010 to 2012 with those made in 1981. Her degrees are in biology and chemistry (BA Wellesley College) and biochemistry (PhD University of Massachusetts at Amherst). Her interest in Oreonana vestita and other plants at high elevation in the San Gabriel Mountains grew out of the Lily Spring Area Survey. Jane is our chapter's current treasurer.